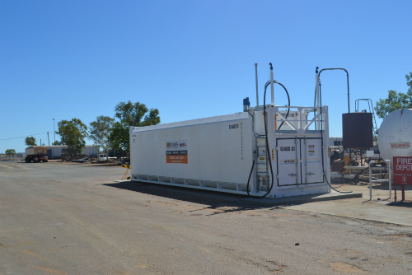 Recently we did a site installation of a GrandeX68 self bunded tank for Longreach Council in Queensland, Australia. They were desperate for a refuelling solution that would allow them greater speed and flexibility within the depot for refuelling machinery & trucks. The other requirement was full Australian standards compliance on the equipment and minimal disruption to existing operations during the installation phase. One of the biggest caveats around this was the need for MINIMAL building work. The end product speaks for itself. It was a straight forward job with a satisfied customer at the end of the job. We captured a great video of the installation team on route to the job. Puma Energy fuel delivery truck 120,000l capacity approx..
Semi-trailer with 67,120 safe fill level fuel storage tank. Support vehicles and installation crew. What we hope it shows is the sense of size with our units and the massive capacity these tanks can hold. Make no mistake these are big commercial units that deliver big commercial efficiencies once installed.